Heat 4 table spoons of ghee in a thick bottomed pan. Fry the dry fruits (kaju, kismis and badam) to golden color and keep the aside. Now in the same ghee fry semiya to golden color. Add one and a half cup of water to it. Stir and close the lid. Cook for 6 to 8 mins in a low flame until the water is absorbed and the semiya is cooked well. Now add three fourth cup sugar to it. The sugar starts melting. Stir continuously until the halwa thickens. Now add 1 tea spoon cardamom powder and mix well. Switch off the flame. 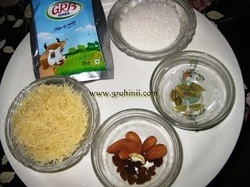 Take the Halwa into a bowl and garnish with the fried dry fruits.